Tenkara flies in general imitate no specific insect, but are pure fantasy patterns. The traditional tenkara flies are called "Sakasa Kebari". Generic for these flies are the very soft reverse hackles, as for example of partridge. When you fish with the tenkara fly rod these reverse hackles fulfill a very important function: like the Italian "Valsesiana" technique the flies are moved slightly pulsating, respectively with a light twitch and are not fished as a "dead drift" (like at the traditional fly fishing with the dry fly). 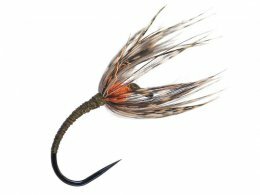 The pulsation or "pumping", which is caused by the reverse hackles, apparently gives the fish the impression of a living insect which gives you better results than fishing with a normal dry fly. The absence of the tail and the used type of hackles make it possible to fish the tenkara flies beneath the surface film of the water, like a wet fly. The lightly pulsating moves magically attract trouts. By lightly greasing the hackles, in contrast the tenkara flies can be fished at the surface film of the water, similar as dry flies. Our 27 various tenkara fly patterns are tied in best quality on premium barbless hooks of the company Dohiku.